Flowers have an important role in Hindu pujas; a ritual is not complete without offering flowers to gods. But we need to know which flowers to offer to which God so that we can get the most out of the Hindu ritual. Let’s first start with the importance of the flowers, then we will move on to which flowers are dedicated to specific gods. 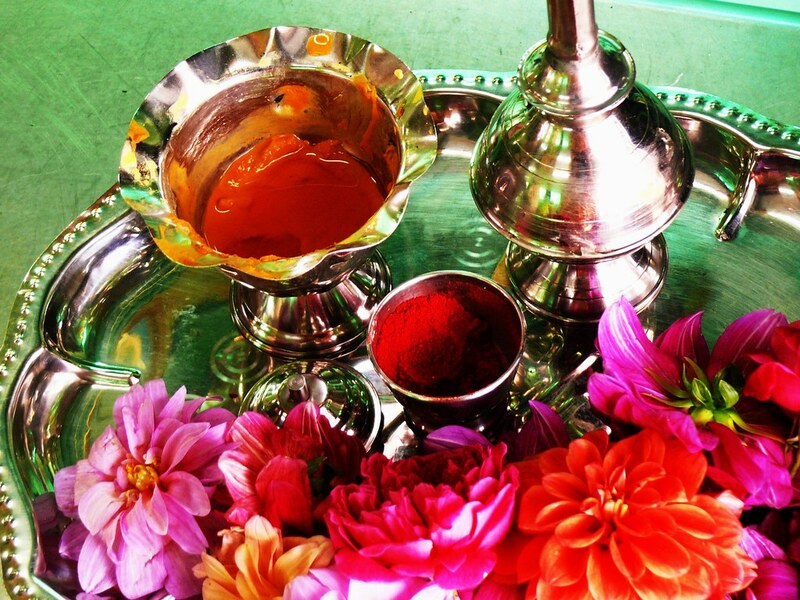 Why are flowers essential in puja ritual? In the atmosphere, there are certain deities roaming with their own frequencies, which are attracted towards certain flowers. Then, when they receive the frequencies, they also send back the frequencies into the atmosphere. This is known as “pavitrak”. In the universe, there is the Ganesh principle that gets attracted to the center of the flower, which sends frequencies in the form of circles. There is the Ganesh principle that gets absorbed by the stem and then gets emitted through petals in the atmosphere. The flower’s stamen absorbs the Ganesh principle in the atmosphere and then released particles which donate prana shakti. The nature of Hibiscus flower is raja-sattva. Thus, the petals emit divine energy (Shakti) and divine consciousness (Chaitanya). Due to the pavitraks projected by the Sattvic flowers, the negative energies in the atmosphere gets destroyed. There are Sattvic flowers that fight with these energies in the atmosphere by releasing the frequencies of deity principles. These energies when in contact with a normal person can bring troubles and sufferings. There is a difference between negative energy and black energy. The negative energies are the ones that cause distress. But black energies are the negative energies of divine energies of the deities. Why specific flower to specific deities? There is a concept that each deity should be offered each flower. The reason is rather scientific. Each flower has its own color and fragrance, which means that the frequency capacity of each flower is unique. Thus, each flower has the capacity to attract the principles of specific deity that can benefit the worshippers. Moreover, if each worshipper has more spiritual emotion for the flowers, then the frequencies of the deities get more activated in the medium and can work for the worshipper directly. Why is it necessary for the flowers to be fresh? The religious scriptures hold that only the best of things should be offered to the deities, and it does not make flowers any exception. Thus, only the flowers that have not been dried out or infected with insects are offered to the deities. The reasons for this are that when we offer something to deity, they accept it in subtle level. Then, they pleased and offer us their blessings. Thus, what we offer to them has to be the best to get the best blessings in return. Also, the capacity of the flower to absorb and emit the frequencies can get reduced if the flower is dry or infested with insects. Flowers that we have touched or handled with the left hand or have taken a smell of should not be offered. Flowers that have fallen to the ground or flowers which do not have any fragrance should not be offered. Flowers which is yet to be bloom completely should not be offered. Flower buds are also not advised to be offered. Flowers that are stolen from other people’s houses should not be offered. Flowers that are dipped or washed in water should also not be offered. We can sprinkle water on flowers, but not dip them. Why shouldn’t you pluck buds after sunset? Sanatan Hindu Dharma talks about the consideration of right time for everything in life. Thus, there is also a right time for plucking flowers. The science of spirituality in Sanatan Dharma prohibits people from plucking buds on evenings. The Pavitraks are projected on large scale on earth during the Brahma Muhurta. Thus, they get attracted on a larger scale towards the flowers that have the capacity to attract Pavitrak. In the atmosphere, the sunlight causes disintegration of Raja-Tama particles. Thus, the atmosphere before the sunset is more sattvic. Also, the strong negative energies and black energies increase after the sunset. This can cause distressing frequencies and thus the attraction of the deity principle gets reduced. Thus, the prohibition exists. However, there are exceptions to the rule. Flowers like Bela, Chameli, Rajanigandha and others only bloom at the evening, when they wait for the Bramha muhurta. They also have more fragrance in comparison to other flowers. Plucking flowers without taking bath or taking your shoes off is not advised. Expressing gratitude to the plant you pluck the flowers from is essential. You can also chant the mantras of your favorite deity while plucking the flower. The son of Virochanaa (a Daitya King), Vali, asks his guru Sukracharya about the special merits of flower offering to the gods and goddesses. Penance first sprang into life. Afterwards came Dharma (or compassion and other virtues). In the interval between started into life many creepers and herbs. Translated as – Flowers gladden the mind and confer prosperity. Hence, men of righteous deeds bestowed the name Sumana on them. Which flowers to offer Hindu Gods and Goddesses? Lord Shiva – Any white flower. Maulshri, blue lotus, and Kaner. Other flowers like bel leaves, Dhatura flowers, Naagkeshar, Harsingar, aak are also his favorites. But during Shiva Pooja, you can’t miss having Bilvapatra. But the chakra and the Bajra should not be present in the Bilvapatra. (Chakras are white marks made by insects while Bajra is the thick portion). If they are present, you need to take them off. Lord Ganesha – Any red flower. Jaswanti (Hibiscus) is his favorite. Lotus, Champa, rose, jasmine, marigold, Dhruva grass blades, Bilva leaves, herbal leaves can also be used to worship him. During Ganesha Pooja, it is advised to use 21 different varieties of flowers. Goddess Parvati – All flowers that can be offered to Lord Shiva. You can also use white lotus, Bela, Palash, Madar, Apamarg, Champa, and Chameli. Goddess Durga – All red flowers. Lotus, Mogra flower and bel leaves can also be offered. Lord Vishnu – Lotus is his favorite. Other flowers like pink lotus, Maulshri, Juhi, Kadamb, kewra, Chameli, Champa, Ashok, Malti, Basanti can be used. Goddess Lakshmi – Lotus is her favorite. Yellow Gaindha, desi Gulab, pink lotus can be used. Which flowers to NOT offer Hindu gods and goddesses? Lord Shiva – Champa, Ketaki, kewda. They were cursed by Shiva.